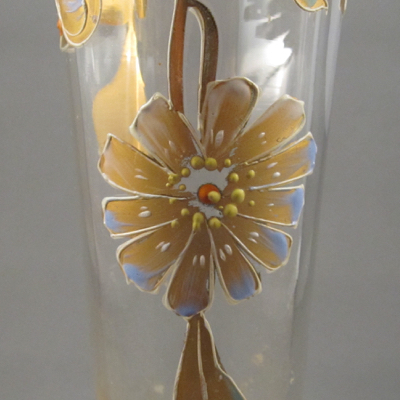 I found this pretty Bohemian crimped-edge glass vase at a small antiques shop near my house in the Catskills a few summers ago. 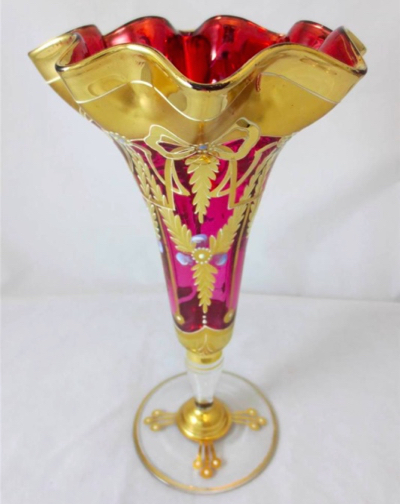 It is decorated with enamel and gilt flowers in the Art Nouveau style and measures 10 inches high and 6.5 inches in diameter at the base. 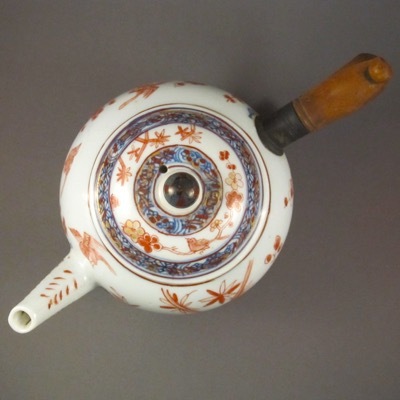 It was made in Europe at the turn of the 19th century. 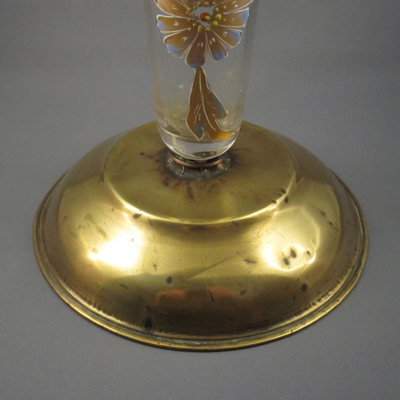 Although it has an unusual make-do base repurposed from a brass lamp, I hesitated at first as it didn’t call out to me as most antiques with inventive repairs do. 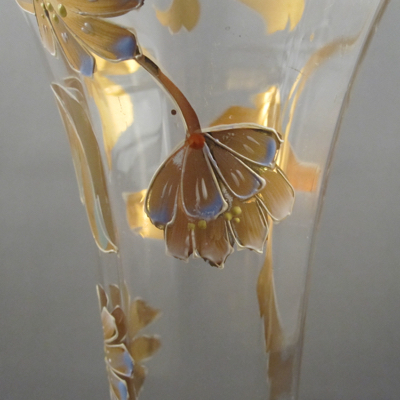 But I ended up buying it and in the years since it has grown on me. 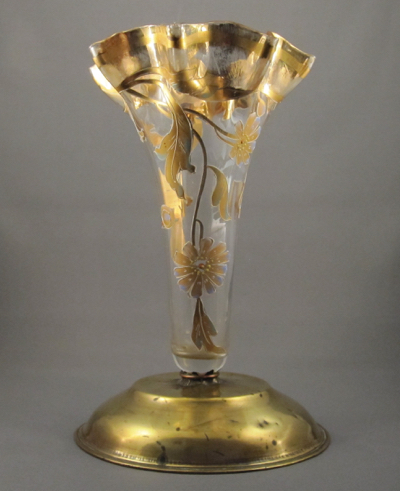 The dealer I purchased it from had polished the replacement base within an inch of its life, buffing the brass to match the lustre of the gilding. 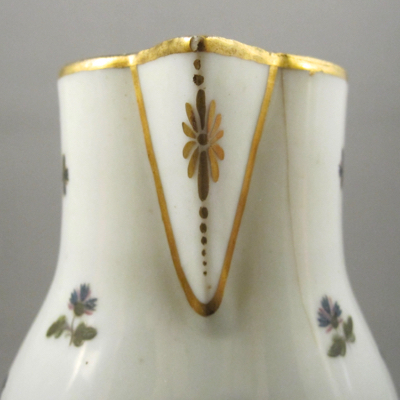 Typically, I prefer my early repairs to have a dark, rich patina, but in this case I like the gold on gold coloring. 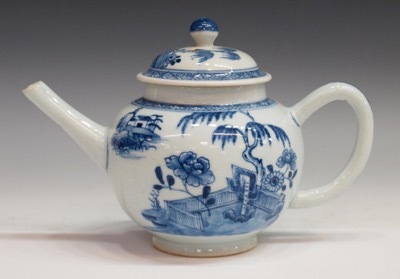 It just seems right. 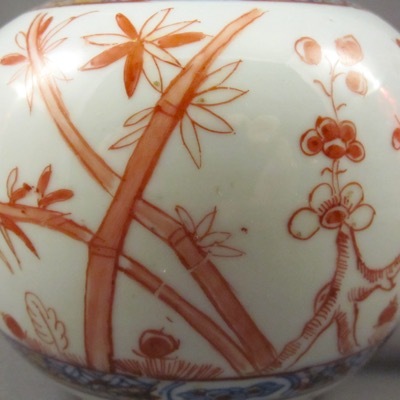 This vase of similar form suggests what the base on mine might have looked like. 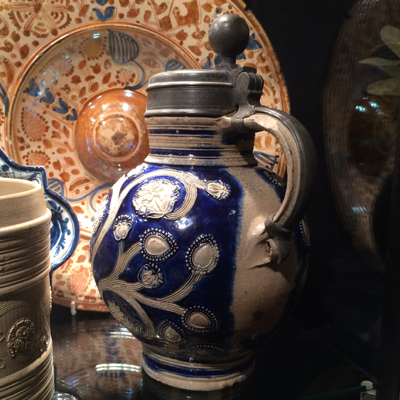 This past Wednesday I attended the preview opening of the New York Ceramics & Glass Fair, the “jewel in the crown of New York’s Winter Antiques Week,” at the Bohemian National Hall in Manhattan. 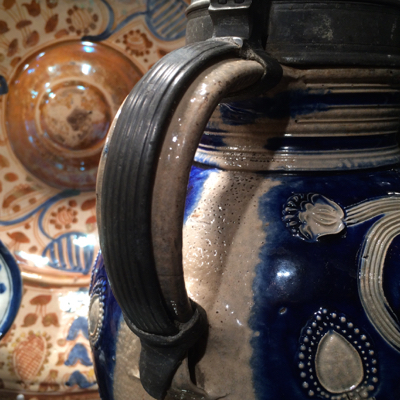 My friend Bibiana and I enjoyed meeting up with old friends and seeing what new treasures the dealers unveiled. 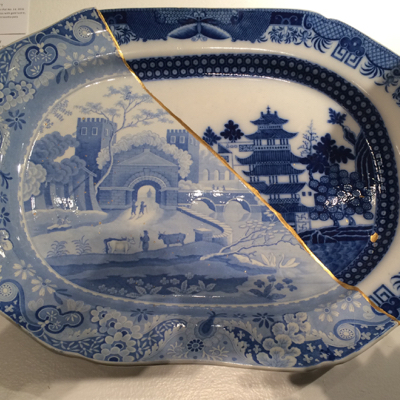 At Ferrin Contemporary I found a striking collage by Paul Scott made from two different antique ceramic platters with blue & white transfer decoration, melded together using kintsugi and gold leaf. 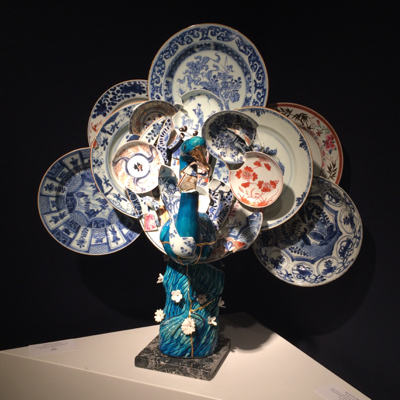 Also on display was a large sculpture, Peacock 1, by Bouke de Vries, made from broken antique ceramics. 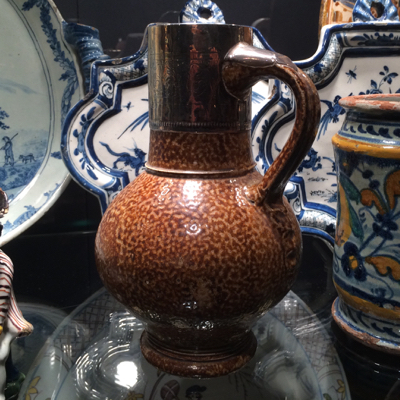 I found this pair of German stoneware jugs at Martyn Edgell Antiques Ltd. 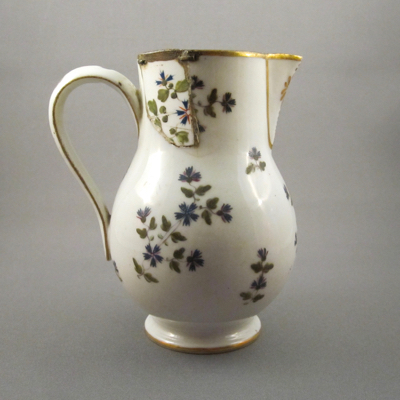 The Westerwald jug at top has incised decoration and cobalt glaze, c.1695. 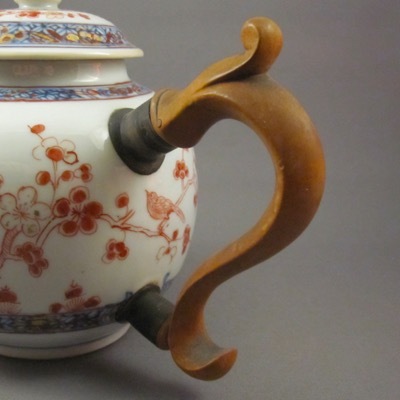 The early ribbed pewter band on the handle repairs an old hairline crack. 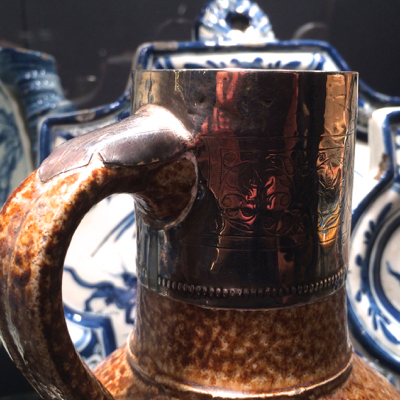 The second jug, from around 1600, has a large ornate engraved English silver mount. 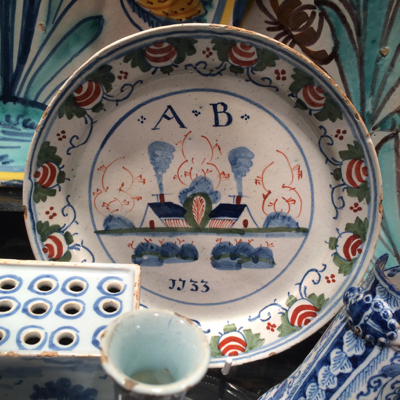 Martyn also had this plate with wonderful decoration, including my initials. 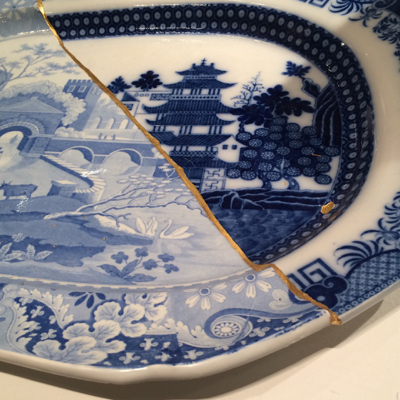 Too bad it’s not damaged, for if it were riddled with metal staples repairing a multitude of cracks, I would have snatched it up in a jiff. 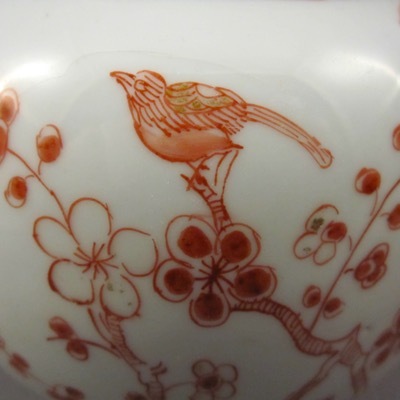 This hard paste porcelain baluster-form jug with sparrow beak spout was made in Paris, France, by Andre Leboeuf at the Fabrique de la Reine factory, circa 1778. 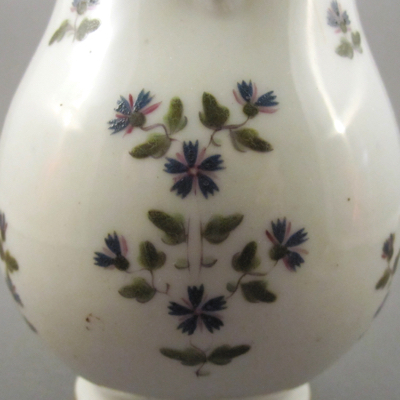 It is hand decorated in the ‘Cornflower’ pattern, also known as ‘Angoulême’ or ‘aux Barbeaux’, a favorite of Marie Antoinette and Thomas Jefferson. 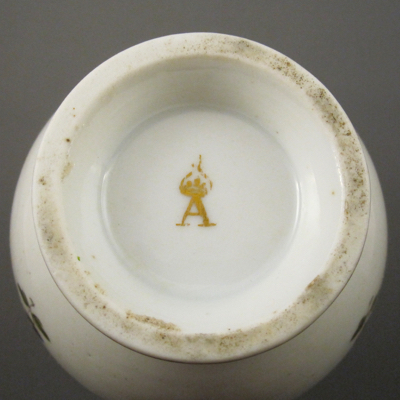 It measures 4.75 inches high and is marked on the underside with the letter ‘A’ and a gilt crown. 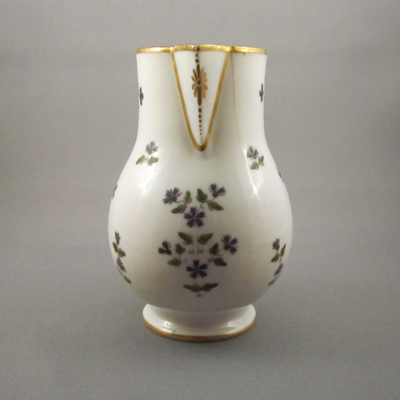 Work of this kind is known as Porcelaine à la Reine and Old Paris Porcelain. 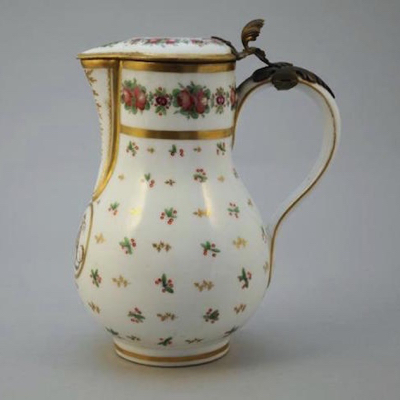 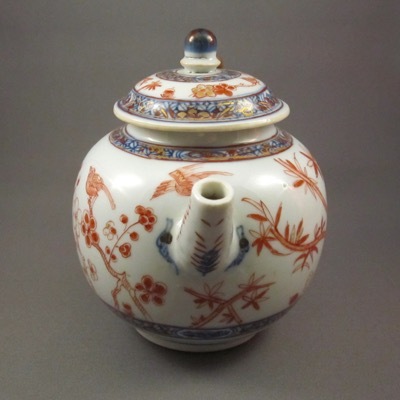 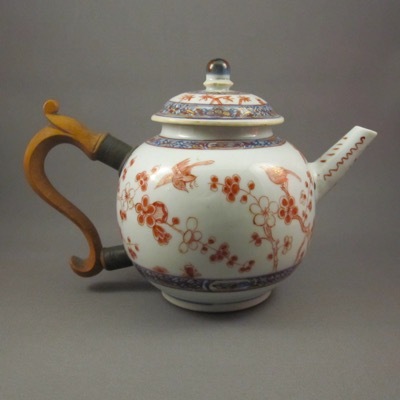 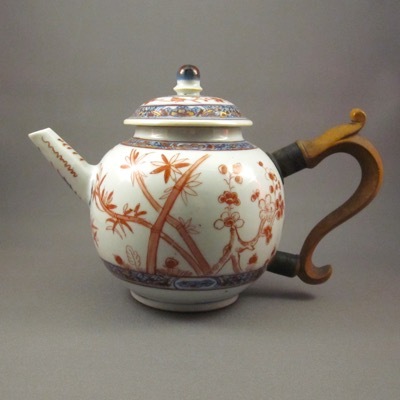 Unlike obvious repairs, such as replacement handles, spouts and lids, this jug possesses a chip off the old block, or more precisely, a chip off an old pot. 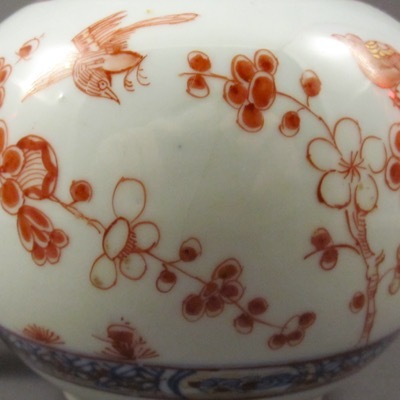 The lip must have been so badly damaged that a jeweler or china mender had to graft on a piece from another vessel. 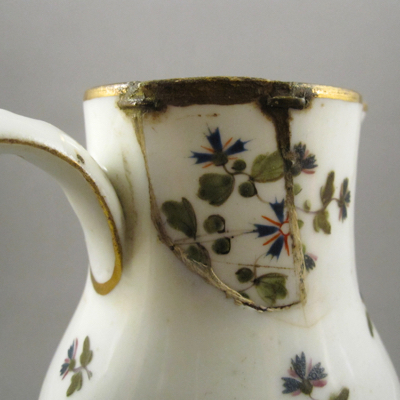 The replacement piece, unintentionally cut in the shape of the State of Nevada, was fitted to the enlarged hole in the jug, just like a jigsaw puzzle, using two small brass rivets along the rim. 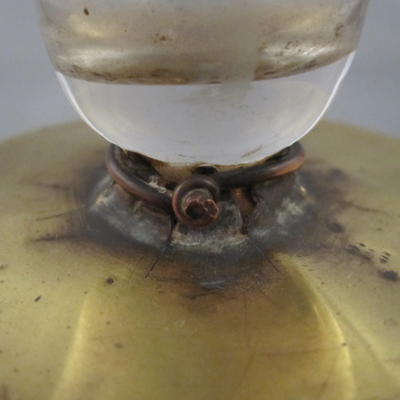 An adhesive compound was applied along the edges to seal the deal. 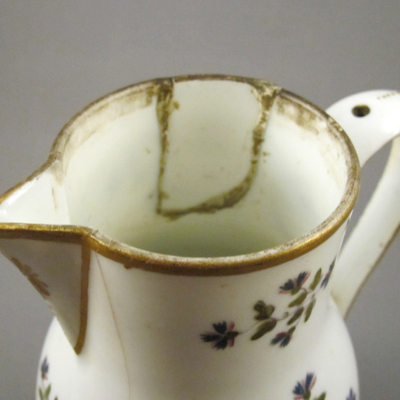 Not the most elegant of repairs but this jug must have meant so much to its original owner that a delicate jug with a Nevada-shaped patch was better than no jug at all. 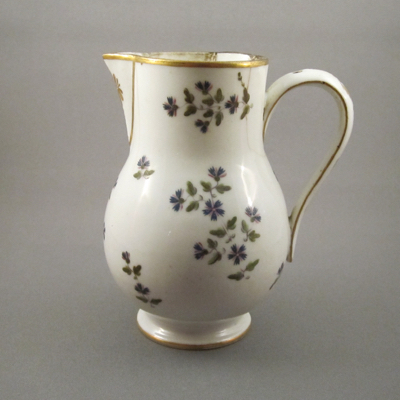 This jug shows what the missing cover and metal mount on my jug might have looked like before Napoleon smashed it to the floor.